This article is about the Pacific island. For the Roman ruins, see Pompeii. For the modern Italian city, see Pompei. For the Classical Roman leader, see Pompey. Pohnpei "upon (pohn) a stone altar (pei)" (formerly known as Ponape or Ascension) is an island of the Senyavin Islands which are part of the larger Caroline Islands group. It belongs to Pohnpei State, one of the four states in the Federated States of Micronesia (FSM). Major population centers on Pohnpei include Palikir, the FSM's capital, and Kolonia, the capital of Pohnpei State. 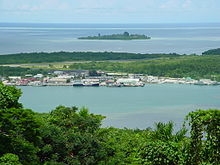 Pohnpei Island is the largest (334 km²), with a highest point (almost 800m), most populous (34,000 people), and most developed single island in the FSM. Pohnpei also contains a wealth of biodiversity. It is also one of the wettest places on Earth with annual recorded rainfall exceeding 7,600 millimetres (300 in) each year in certain mountainous locations. It is home to the ka tree (Terminalia carolinensis) found only in Pohnpei and Kosrae. The highest point of the island is Mount Nanlaud at 772 or 782 metres. Pohnpei is home to several dozen bird species including four endemic species, the Pohnpei lorikeet, the Pohnpei fantail, the Pohnpei flycatcher and the long-billed white-eye. A fifth endemic, the Pohnpei starling, is thought to have recently gone extinct. The only land reptiles are a few species of lizard. Originally, only three mammals existed: rats, bats and dogs. Pigs were introduced, and some are now feral, as are the deer brought during German times. The lagoons are rich in fish, mollusks, turtles and other marine fauna. Pohnpei belongs to the Tropical rainforest climate zone (Köppen: Af). It is one of the wettest places on earth with an average annual recorded rainfall of 4,775 mm (188.0 in) in towns along the coast and about 7,600 mm (300 in) each year in certain mountainous locations. The earliest settlers were probably Lapita culture people from the Southeast Solomon Islands or the Vanuatu archipelago. Pre-colonial history is divided into three eras: Mwehin Kawa or Mwehin Aramas (Period of Building, or Period of Peopling, before c. 1100); Mwehin Sau Deleur (Period of the Lord of Deleur, c. 1100 to c. 1628);[note 1] and Mwehin Nahnmwarki (Period of the Nahnmwarki, c. 1628 to c. 1885). Pohnpeian legend recounts that the Saudeleur rulers, the first to bring government to Pohnpei, were of foreign origin. The Saudeleur centralized form of absolute rule is characterized in Pohnpeian legend as becoming increasingly oppressive over several generations. Arbitrary and onerous demands, as well as a reputation for offending Pohnpeian deities, sowed resentment among Pohnpeians. The Saudeleur Dynasty ended with the invasion of Isokelekel, another semi-mythical foreigner, who replaced the Saudeleur rule with the more decentralized nahnmwarki system in existence today. Pohnpeian historic society was highly structured into five tribes, various clans and sub-clans; each tribe headed by two principal chiefs. The tribes were organized on a feudal basis. In theory, "all land belonged to the chiefs, who received regular tribute and whose rule was absolute." Punishments administered by chiefs included death and banishment. Tribal wars included looting, destruction of houses and canoes and killing of prisoners. Pre-Spanish population estimates are deemed unreliable. Pohnpei's first European visitor was Spanish navigator Álvaro de Saavedra on 14 September 1529 shortly before his death, when trying to find the way back to New Spain. He charted it as San Bartolomé and called this one and the surrounding islands as Los Pintados (literally, "the painted ones" in Spanish) because the natives were frequently tattooed. It was later visited by the Portuguese navigator Pedro Fernandes de Queirós, commanding the Spanish ship San Jeronimo. on 23 December 1595; his description is brief, he made no attempt to land. There is good documentation about Australian sailor John Henry Rowe, who arrived in his barque John Bull on 10 September 1825, though he did not land as his vessel was chased off by native canoes. The first lengthy description of the island and its inhabitants is presented by the Russian explorer Fyodor Litke, whose ship Senyavin gave the island group of Pohnpei, Ant and Pakin its name. From 14 to 19 January 1828, his boats attempted to land but could not due to the hostility shown by the islanders, but natives then came aboard his ship, "some trading occurred, a short vocabulary was compiled, and a map made." F.H. von Kittlitz, a member of the Litke expedition made a further descriptive account, including the offshore ruins of Nan Madol, and the two reports together provided the first real knowledge of Pohnpei. It is not clear who the next visitors were; however, when Capt. J.H. Eagleston of the barque Peru sighted the island on 3 January 1832 it was already on his charts as "Ascension Island;" Riesenberg writes that it is uncertain who first called it Ascension Island, but the name became established until the Spanish period. From this time onward whaling and trading vessels came in increasing numbers. Very soon a "large colony of beachcombers, escaped convicts, and ship's deserters became established ashore," identified as "chiefly bad characters," according to the log of the Swedish frigate Eugenie. The first missionary to arrive was Father Louis Désiré Maigret, a Roman Catholic priest. He had sailed from Honolulu on the schooner Notre Dame de Paix and began his efforts in December 1837, but he departed on 29 July 1838 for Valparaíso after seven unsuccessful months. In his company were "several Mangarevans and Tahitians," some of whom remained on Pohnpei and left descendants. Ten years later Maigret returned to the Hawaiian kingdom as Bishop of Honolulu. A group of Protestant missionaries from New England established themselves permanently on Pohnpei in 1852. Their letters and journals contain a wealth of information about the island and are preserved at Harvard University. A drastic population decline occurred after 1854, due to a smallpox epidemic. During the American Civil War, to counteract the United States blockade of their ports, Confederate States Navy ships hunted Yankee merchant shipping. On April 1, 1865, the CSS Shenandoah surprised four United States whalers at Ascension Island (Pohnpei) and destroyed them all. The local king, Nananierikie, was delighted to receive much of the spoils from this action. By 1886 the Spaniards claimed the Caroline Islands which were part of the Manila-based Spanish East Indies and began to exert political authority. They founded the city Santiago de la Ascensión in what today is Kolonia (from Spanish colonia or colony). The Spanish built several government buildings, a fort, a church and a school. Spanish Capuchin friars were also sent from Manila to Pohnpei to preach the Catholic faith. After the 1898 Spanish–American War, the German Empire purchased the Caroline island group from Spain in 1899 together with the Marianas (except Guam) and 4 years later the Marshall Islands for 17 million goldmark. During the German administration a fundamental change in land ownership was implemented on Pohnpei and throughout the Carolines. Beginning in 1907 the feudal system, where all land is held in fief, was gradually replaced with the issuance of individual deeds to land. The chief's economic advantages were thus reduced, and only force of tradition granted a first harvest tribute to chiefs. With land holding, taxes came due and new owners, in lieu of payment, were obliged to work 15 days per year on public projects, such as wharf construction, road building, etc. One such work for taxes engagement sparked the Sokehs Rebellion. It began as an insubordination event during road construction on Sokehs Island, then escalated into the murder of 9 persons, the subsequent apprehension and trial of 36 Sokehs rebels, the execution of 15 insurgents, and banishment for others to Babelthuap in the German Palau Islands. The German census of 1911–12 shows 3,190 Pohnpeians, 585 Central Carolinians and 279 Melanesians. Many of the outer islands were resettled (mainly on Sokehs Island) in consequence of destructive typhoons in their home islands. A special census conducted in late 1947 shows a total population of 5,628, of which 4,451 were Pohnpeians, and 1,177 were natives of other Pacific islands. By 1963 the population had grown to nearly 10,000. With the Treaty of Versailles, Japan as mandatory power assumed control of all German colonial possessions north of the equator, having occupied Pohnpei along with the rest of the Carolines, the Marshalls, the Marianas (except for American-owned Guam) and Kiautschou Bay during World War I. In subsequent years and during World War II the Japanese garrison strength was composed of about 2,000 men of the IJN under Captain Jun Naito and 5,984 IJA men under Lieutenant General Masao Watanabe. However, Pohnpei was bypassed by the US Navy during the island-hopping amphibious campaigns of 1943–1945. The island was shelled on several occasions, including by the battleships USS Massachusetts, USS Alabama, and USS Iowa, as well as air attacks launched from USS Cowpens. After the war, Japanese nationals were repatriated to Japan by the US Navy. The population of the state in 2010 was approximately 34,000. While the majority of the population consider themselves ethnic Pohnpeians, Pohnpei is more ethnically diverse than any other island in the FSM. This is largely due to more than a century of foreign colonial occupation, bringing in Spanish, German, Japanese, Chamorro, Filipino, US, Australian, other western Europeans, and it being home to the capital of the national government, which employs hundreds of people from the other three FSM States (Yap, Chuuk, Kosrae) having distinct ethnic and cultural origins. The indigenous makeup also includes the multiple regional ethnicities of the outer islands within Pohnpei State, resulting in a mix of Australasian Pacific Islanders and hence making Pohnpei Island the FSM's melting pot. 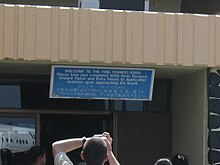 Sign for travelers at Pohnpei International Airport in official English and in Japanese. The Pohnpeian language (formerly called "Ponapean") and its dialects are the indigenous languages of Pohnpei. The Federated States of Micronesia government also uses English as an official language. Pohnpei International Airport (IATA code PNI) is located near Kolonia, on a small island named Deketik off the northern coast of the main island. The FSM is part of the international Olympic movement, originally the work of James Tobin, who now sits on the IOC Executive Board, sending teams to the summer games beginning in 2000 with the Sydney games and continuing every four years to the present with athletes participating in track and field, swimming and weightlifting. The most notable Pohnpeian athlete is marathoner Elias Rodriguez who ran for the FSM at the Sydney Olympics. Rodriguez finished last in the marathon but was cheered on by tens of thousands of spectators and watched by millions of television viewers as he entered the Olympic stadium for a final lap immediately prior to the closing ceremony which was delayed to allow his finish. 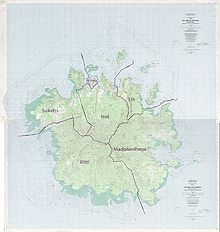 Pohnpei (as Ponape) plays a role in several stories in Cthulhu Mythos by H. P. Lovecraft and others. Its role in "Out of the Aeons", by Lovecraft and Hazel Heald, was inspired by the ruins of Nan Madol (see above), which had already been used as the setting for a lost race story by Abraham Merritt, The Moon Pool, in which the islands are called Nan-Matal. [note 2] The island of Pohnpei was used in the Call of Duty Black Ops 3 map Zetsubou No Shima. Pohnpei is a central location in South Sea Adventure (1952), the second of Willard Price's Young Adult Adventure Series books featuring Hal and Roger Hunt. Pohnpei, or "Ponape" as it is spelled, is stated as the home island of "Mike" on the popular blog Dunce Upon A Time, authored by BC Woods. Pohnpei State Department of Education operates public schools. ^ The Saudeleur era lasted around 500 years. Legend generally dates their downfall to the 1500s, however archaeologists date Saudeleur ruins to c. 1628. ^ "they had set forth for the Nan-Matal, that extraordinary group of island ruins clustered along the eastern shore of Ponape in the Carolines"
^ "Weatherbase: Historical Weather for Pohnapei, Federated States of Micronesia". Weatherbase. 2011. Retrieved 24 November 2011. ^ a b c d e f g h i j k l m n Riesenberg, Saul H (1968). The Native Polity of Ponape. Contributions to Anthropology. 10. Smithsonian Institution Press. pp. 38, 51. Retrieved 1 January 2012. ^ McCoy, Mark D.; Alderson, Helen A.; Hemi, Richard; Cheng, Hai; Edwards, R. Lawrence (November 2016). "Earliest direct evidence of monument building at the archaeological site of Nan Madol (Pohnpei, Micronesia) identified using 230Th/U coral dating and geochemical sourcing of megalithic architectural stone". Quaternary Research. 86 (3): 295–303. doi:10.1016/j.yqres.2016.08.002. Archived from the original on 30 December 2016. Retrieved 28 December 2016. ^ Flood, Bo; Strong, Beret E.; Flood, William (2002). Micronesian Legends. Bess Press. pp. 145–7, 160. ISBN 1-57306-129-8. Retrieved 1 January 2012. ^ a b Hanlon, David L (1988). Upon a Stone Altar: A History of the Island of Pohnpei to 1890. Pacific Islands Monograph. 5. University of Hawaii Press. pp. 13–25. ISBN 0-8248-1124-0. Retrieved 1 January 2012. ^ Cordy, Ross H (1993). The Lelu Stone Ruins (Kosrae, Micronesia): 1978–81 Historical and Archaeological Research. Asian and Pacific Archaeology. Social Science Research Institute, University of Hawaii at Manoa. pp. 14, 254, 258. ISBN 0-8248-1134-8. Retrieved 31 December 2011. ^ Morgan, William N (1988). Prehistoric Architecture in Micronesia. University of Texas Press. pp. 60, 63, 76, 85. ISBN 0-292-76506-1. Retrieved 31 December 2011. ^ a b Panholzer, Tom; Rufino, Mauricio (2003). Place Names of Pohnpei Island: Including And (Ant) and Pakin Atolls. Bess Press. pp. xiii, xii, 101, . ISBN 1-57306-166-2. Retrieved 31 December 2011. ^ Micronesica. University of Guam. 1990. pp. 92, 203, 277. Retrieved 31 December 2011. ^ Ballinger, Bill Sanborn (1978). Lost City of Stone: The Story of Nan Madol, the "Atlantis" of the Pacific. Simon and Schuster. pp. 45–8. ISBN 0-671-24030-7. Retrieved 31 December 2011. ^ a b Takizawa, Akira; Alsleben, Allan (1999–2000). "Japanese garrisons on the by-passed Pacific Islands 1944–1945". Forgotten Campaign: The Dutch East Indies Campaign 1941–1942. Archived from the original on 6 January 2016. ^ Pucin, Diane (2 October 2000). "G'Bye, Mates". Los Angeles Times. Archived from the original on 2 September 2017. ^ Lovecraft, H.P. "Out of the Aeons". Archived from the original on 25 July 2014. Retrieved 16 July 2014. ^ ""south sea adventure" in a sentence - south sea adventure sentence examples - ichacha.net sentence maker". eng.ichacha.net. Archived from the original on 23 February 2018. Retrieved 22 February 2018. ^ "The Micronesian Elvis". Dunce Upon A Time. 30 August 2007. Archived from the original on 2 December 2008. Retrieved 17 August 2009. ^ a b c d "Higher Education in the Federated States of Micronesia Archived 14 October 2017 at the Wayback Machine." Embassy of the Federated States of Micronesia Washington DC. Retrieved on February 23, 2018. ^ "Come Visit Us Archived 23 February 2018 at the Wayback Machine." Our Lady of Mercy Catholic High School. Retrieved on February 23, 2018. "The school is located on the Catholic Mission in Kolonia near the Spanish Wall"
The Island of the Colour-blind, Oliver Sacks, Publisher: Pan Macmillan (6 June 1997), paperback, ISBN 0-330-35234-2. David Childress. "The Lost City of the Pacific". Omega Science Digest (March 1986), pp. 48–55, 121. Wikimedia Commons has media related to Pohnpei. Wikivoyage has a travel guide for Pohnpei.